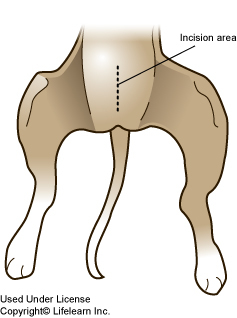 A caesarean section or c-section is major surgery performed to remove puppies from the uterus. This is most commonly performed as an emergency procedure when there is difficulty with natural birth. Most dogs recover quickly from this procedure; however, if your dog was in labor for several hours before surgery was performed, her recovery will be slower, and she will need extra attention and help with her puppies. What should I expect during the mother's recovery period? The mother has been given an anesthetic that should be eliminated from her body quickly. Most dogs have fully recovered from anesthesia by the time they are discharged to go home. Complete recovery from anesthetic may take two to six hours, depending on the anesthetics used, the mother's physical condition and age at the time of surgery, and how long she was in labor before the surgery. "During the immediate recovery period, she must be closely monitored so that she does not fall and hurt herself, or roll over and crush the puppies." During the immediate recovery period, she must be closely monitored so that she does not fall and hurt herself, or roll over and crush the puppies. The puppies should not be left alone with her until she is completely awake, able to stand on her own, and interested in caring for her puppies. The mother should begin eating within a few hours. You should offer her small amounts of food and water frequently (every 15 to 30 minutes) for the first 24 hours after surgery. If she eats or drinks too much or too quickly, she may vomit. Her food intake at this time should be about one-and-a half times her normal food intake. By the third or fourth week of nursing, her food intake may be 2 to 3 times normal. She should be fed a premium brand high-quality dog food during the period of nursing in order to provide the appropriate nutrition for her and her litter. "Do not give your dog any medication, including herbal preparations, without consulting your veterinarian." The mother's temperature may raise 1º-2ºF (0.5-1.0ºC) above normal the first 1-3 days after delivery, then it should return to the normal range. The normal range is 100º-102ºF (37.8º-38.9ºC). Do not give your dog acetylsalicylic acid or ASA (Aspirin®), acetaminophen (Tylenol®) or any other medication, including herbal preparations, without consulting your veterinarian. If the mother's temperature goes above 104ºF (40ºC), she and her litter should be examined by your veterinarian as soon as possible. Is a bloody vaginal discharge from the mother normal? A bloody vaginal discharge is normal for three to seven days following birth. It may be quite heavy for the first one to three days after delivery and then begin to diminish. If it continues for longer than one week, or if it changes color or develops an odor, the mother should be checked for the presence of infection or other complications. If she had an ovariohysterectomy (was spayed) at the time of the c-section, she should have little or no vaginal discharge. When are the mother's stitches removed? The stitches may or may not need to be removed, depending on the type of suture material used. Many veterinarians will use internal, absorbable sutures that will not be visible and do not require removal. As a general rule, if the stitches are visible, they will have to be removed, usually 10-14 days after surgery. If skin staples were used, they will also require removal in 10-14 days. How should I care for the puppies? The puppies should be ready to nurse as soon as you arrive home. Although the mother may not be awake enough to nurse the puppies alone, you can help by making the mother lie still so the puppies can nurse. Gently place the puppies near the mother's teats. If a puppy seems reluctant to nurse, you may gently massage the teat to express some milk, which may induce the pup to begin nursing. "Your veterinarian should be able to supply you with a commercial puppy milk replacer..."
1 cup milk + 1 tablespoon corn oil + 1 pinch of salt + 3 egg yolks (no whites). Blend together until uniform. It should be fed at the rate of l oz (30 ml) per 1/4 lb. (1/8 kg) of puppy weight PER 24 HOURS. That amount should be divided into 3-5 feedings. The average newborn, small breed puppy weighs approximately 1/4 lb. (1/8 kg) at birth, while a large breed puppy weighs ½ to 1 lb. (1/4 -1/2 kg). 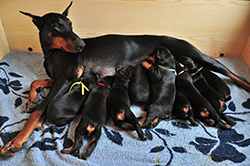 Although it is preferable that puppies begin nursing immediately, a healthy newborn can survive without complication for up to twelve hours without nursing. However, if the newborn is weak, dehydrated or cold, nourishment must be given as soon as possible. How warm should the room be where the puppies are? "A newborn puppy is not able to regulate its body temperature very well." A newborn puppy is not able to regulate its body temperature very well. As long as the puppies stay near their mother, the room temperature is not too critical. However, if they are not with their mother, the room temperature should be 85º-90ºF (29.4º-32.2ºC). To avoid any chance of hypo- or hyperthermia (chilling or overheating), the newborns should be kept inside the house if possible. For further information about care of the puppies, see our handouts "Breeding 6 - Rearing Puppies and Care of Mother" and "Breeding 7 - The Growing Puppy, lactation and weaning", and "Breeding 8 - Finding Homes for the puppies and vaccinations". Other handouts in this series contain further information about intestinal parasites, infectious diseases and vaccinations. Your veterinarian can provide you with this information and give you specific advice that relates to your circumstances.